In e-commerce business it is extremely crucial to make sure that checkout is simple to finalize and does not create any trouble for customers since according to e-commerce experts, it is considered as being one of the key factors which cause card abandonment and negatively impacts on overall image of a webstore. Taking the aforementioned issues into account, we would like to shed light on a tool which is capable of providing your storefront with a better customer shopping experience – IWD Checkout Suite Magento 2 Extension. Once you install the module, you will be able to simplify the checkout process, incorporate the best payment processors, optimize user experience, allow your customers to leverage in-store pickup option as well as take full advantage of store credits. Having acquired the Magento 2 checkout extension, you will make a considerable contribution to the overall usability of your webstore, which in its turn, is very likely to impact sales rate and revenue. Furthermore, you can fully rely on IWD support for the company has already gained trust among developers and e-commerce website owners. At the beginning, we have mentioned that one of the key factors which influence the occurrence of the card abandonment issue is complicated checkout. Please see the graph below which depicts other problems which are to be taken into consideration. Among them you can find the obligatory registration, no total order cost, website errors, lack of trust, bad return policy, insufficient amount of payment options, etc. However, the majority of the problems pointed out above can be easily addressed with the assistance of IWD Checkout Suite Magento 2 Extension. In essence, the features the Magento 2 checkout module offers provide a decent solution to the card abandonment issue. Therefore, let’s take a closer look how exactly the Magento 2 tool manages to minimize the significance of the problem, thus impacting on website’s sales rate. In order to ensure the simplicity of checkout, the Magento 2 module reduces the complicated process to one single page. 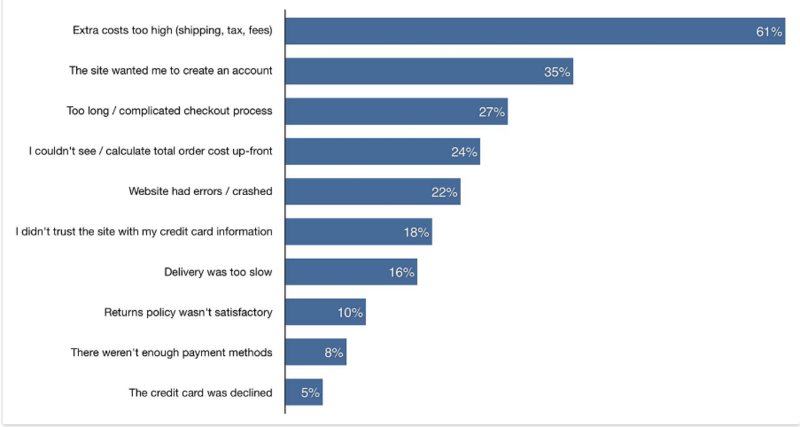 As a result, the time required to complete checkout is dramatically diminished and your customers are more likely to finalize it. By installing the Magento 2 checkout extension, you basically find a solution to one of the key problems which affect the card abandonment rate. Let your clients enjoy quick checkout, avoid intricate procedures. the Checkout Suite Magento 2 tool extends the out-of-the-box Magento payment processor options. Thus, after Magento 2 checkout module installation, you are able to leverage PayPal and BrainTree modules. However, in case, you would like to get more, you can download PRO version which will allow your customers to enjoy Authorize.Net and Apple Pay payment modules. It is obvious that the more options we offer to our clients the easier it is to provide them with what they give preference to. We all know the significance of Gift Cards and how good they are at attracting new customers to a webstore. With the assistance of the Magento 2 checkout extension, you are able to provide your clients with the ability to gift cards to their friends, thus drawing in new people who are likely to become your customers as well for your store has been recommended by a friend. Sometimes customers can indicate a wrong address while passing checkout process. In order to avoid such an issue, the Magento 2 extension makes sure the address your clients enter is deliverable by means of applying UPS or US postal Service. Apart from it, it actually accelerates the checkout process and saves additional expenditures which occur when a product from your store is sent to a wrong address. Provided you install the PRO version of the Magento 2 checkout extension, this feature will be built-in out-of-the-box. We have already figured out that by providing customers with more options we increase the possibility of satisfying their needs. 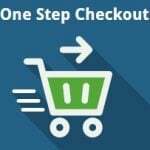 With the help of the Magento One Page Checkout, you are able to offer your clients a in-store pickup option, allowing them to get the products bought on your e-commerce website in your brick-and-mortar store. The feature is configurable. Extend the functionality of a default Magento storefront. Sometimes the process of refunding is a pain in the neck, however, the IWD Checkout Suite offers a solution. Once you install the Magento 2 tool, you are able to leverage store credits which can be only applied in your store, thus providing your customers with the opportunity to the refund in your own “currency”. As a result, the client is committed to spend the money on your website. So, basically, you kill 2 birds with one stone: save sales and decrease the number of problems related refunds management. The in-store credits history can be easily tracked in the backend of your website as well as by the clients themselves in their cabinets. 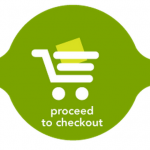 Thus, during the checkout process, the Magento 2 checkout extension reminds them on the possibility to spend their credits. The feature is available in Pro version. In case, you acquire the IWD Checkout Suite PRO version, you will be able to take full advantage of the support the company offers to its clients. Thus, you will not have to preoccupy with extension installation and configurations for IWD team will do it instead of you. In fact, the Magento 2 checkout extension has even more features which can positively impact on your e-commerce business. 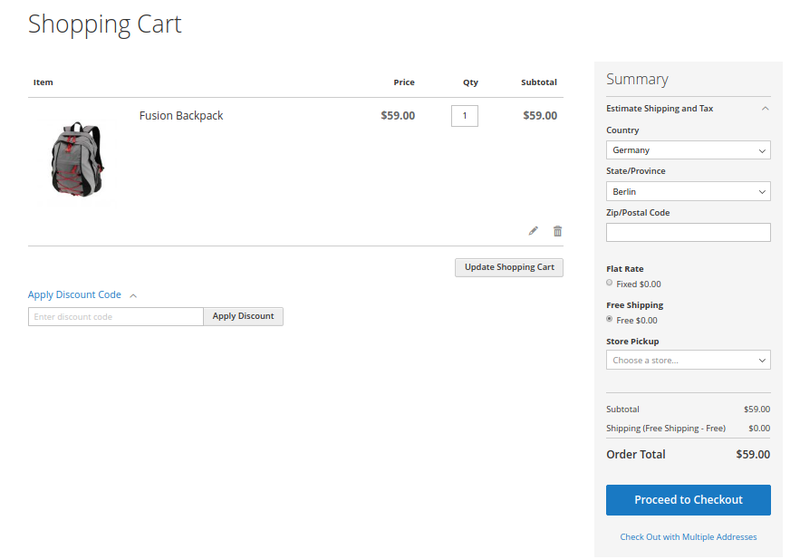 Follow the link below to learn about how the Magento 2 checkout module can be configured to make it meet the needs of your webstore. In case you are using Magento 1, you can also take full advantage of the IWD Checkout Suite Magento 1 Extension. Follow the link below to discover all the features available in Magento 1 version. Well, having discussed the features the IWD Checkout Suite Magento 2 Extension offers, let us see how it all works practically. 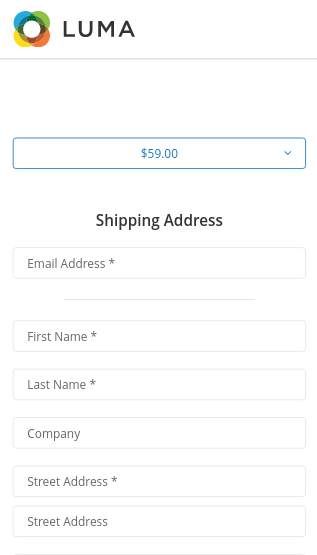 Once you find yourself on a shopping cart page, you will be able to calculate the costs of your shipping, apply discount code, update shopping cart, and choose whether you want to leverage in-store store pickup. 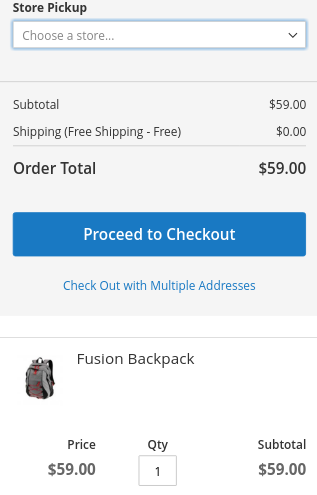 When you click on Proceed to Checkout, a One Page Checkout will appear. Here you are to insert your personal data (email, name, country, phone number, etc), select shipping as well as payment methods. 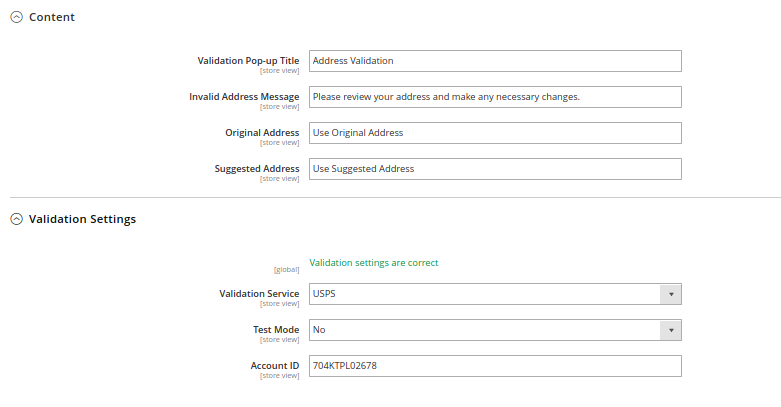 The Validation Service will check whether the address you entered is valid or not. Apart from it, you can leave any comment and sign up for store newsletter. Since the mobile-friendliness is extremely important nowadays, the Magento 2 checkout module offers responsive design to its mobile users. Thus, your website visitors will be able to make purchases even on their mobile devices. As you see, your customers can choose in-store pickup and then proceed to checkout process. Subsequently, they will be taken to checkout page. Here, your clients are to provide address information as well as select one of the offered payment and shipping methods. Besides, in case, they have a discount code, they will be able to insert it to get some price or shipping privileges. To let them stay tuned, they can sign up for your newsletter to be up to date what special offers you have in your online store. As usual, to provide you with a better understanding on the module’s functionality, we describe its backend. 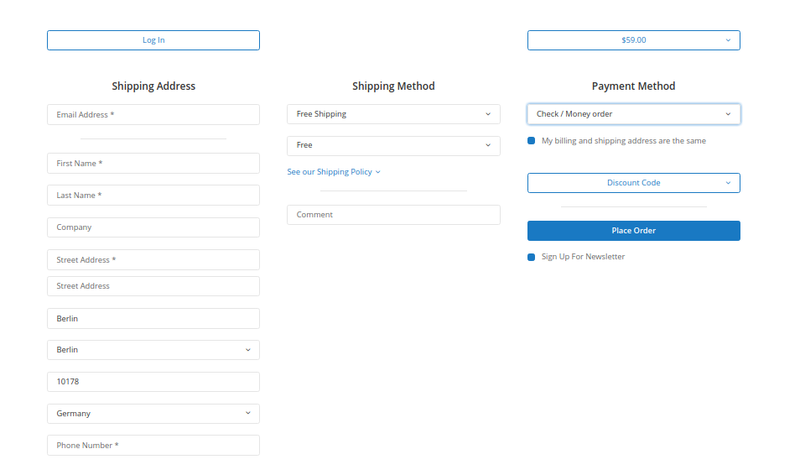 To start with, we would like to showcase the Magento 2 checkout extension’s general configurations (Stores => Configurations => Checkout Suite). Here you can find general information about the IWD Checkout Suite Magento 2 Extension as well as enable/disable the tool. Scrolling down a little bit, you will come across Extended settings. 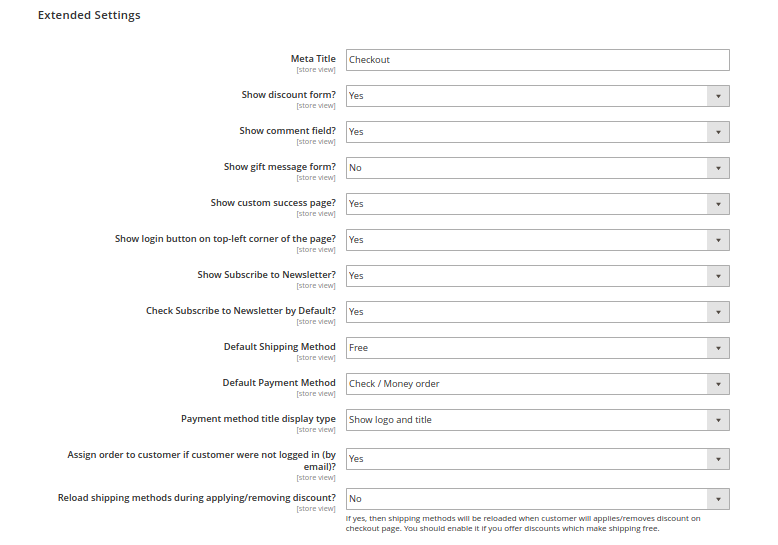 In this backend section, you are to choose whether you want to display discount form, comment field, gift message form, custom success page, etc. 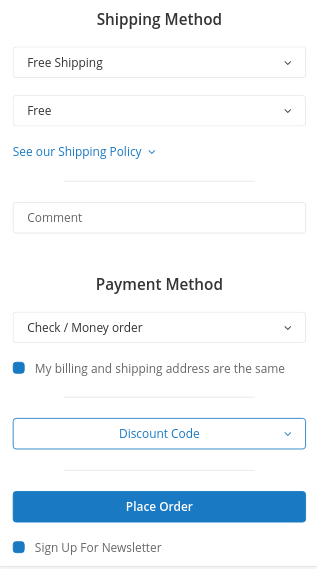 Besides, the Magento 2 checkout extension allows you to set up default shipping and payment methods as well as how they will look in your storefront. 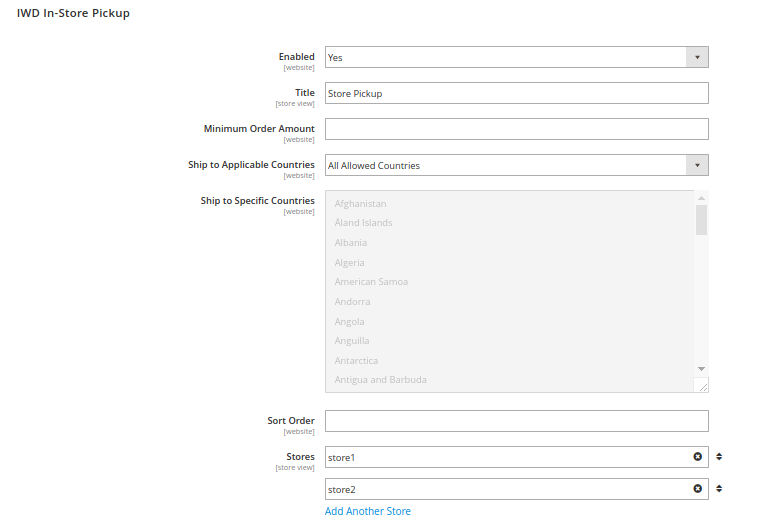 In case, you decide to offer shipping discounts to your customers, then you should enable reloading shipping methods. 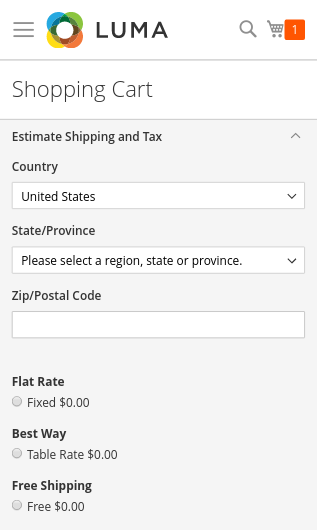 Thus, the shipping costs will be automatically recalculated once your clients apply or remove a discount. Apart from it, we have already pointed out that after Magento 2 checkout extension installation, you will be able to restrict some customer groups to apply certain payment methods. Here below, please see how you can configure it. As you have noticed, it is extremely simple and does not take a rocket scientist to choose what customer groups will be able to enjoy different kinds of payment options (Apple Pay, Bank Transfer, Cash on Delivery, Check / Money order, Authorize.net, Braintree, and many more). If you decide to disable the feature, you won’t have any trouble with it either. However, this functionality gives you more control over your e-commerce webstore. As regards Address Validation feature, it can also be configured. Follow Stores => Configurations => Address Validation. To make sure your customers insert correct data, you can configure the Magento 2 checkout module so that it won’t allow them to finalize checkout, unless the address entered is valid. Besides, in this section, you are to determine Validation Pop-up title and invalid address message as well as select which validation service you would like to use in your storefront: Google, UPS, USPS. Follow Stores => Configurations => Store Credit to configure store credit settings. As you see on the screenshot below, there you will be able to enable the feature, decide whether you want your customers to see Store Credit History as well as determine how Refund Store Credit will function in your webstore. In order to set up In-store pickup configurations, follow Stores => Configurations => Sales => IWD in-store Pickup. Here you are able to enable the in-store pickup functionality, define title as well as minimum order amount to allow your customers to leverage the feature. Apart from it, you can select specific countries which cannot enjoy the in-store pickup. 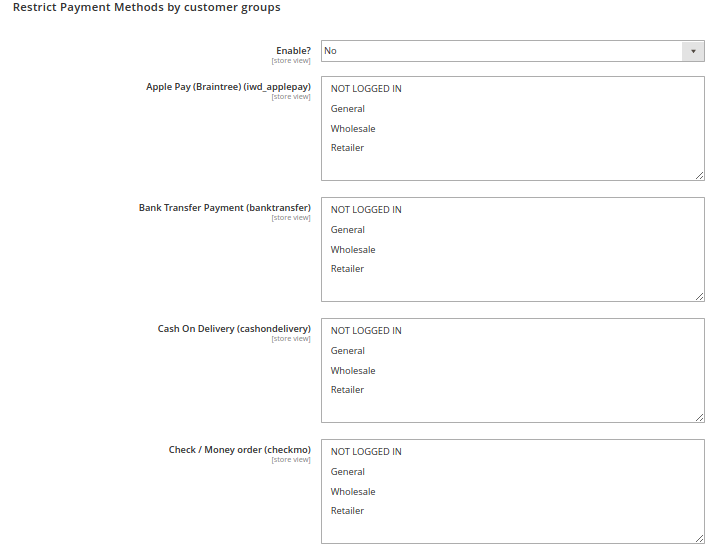 Add stores to which the items bought by your clients will be sent. It is obvious that the importance of having such a tool on a e-commerce website is indisputable. Having figured out the features the IWD module offers, we hope you will leverage the opportunities that come along with it, thus making a great contribution to the development of your business. Furthermore, once you install it, you will be able to dramatically decrease cart abandonment rate. On the official page of IWD Checkout Suite Magento 2 Extension there are around 640 reviews left on the module. Such figures leave no doubts about the quality of the product. The company offers several price options for you to choose what you believe will correspond to your needs. 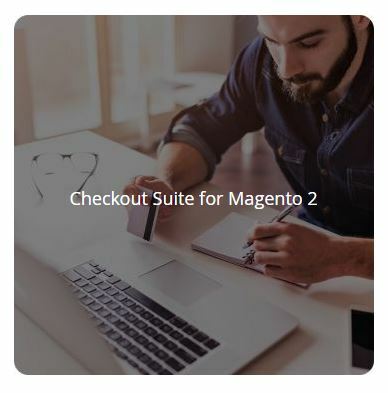 If you have any question on the Magento 2 checkout extension’s functionality or there is something you would like to share with others, you can always do it by following the link below.